„It is not easy, of course, to remain focussed at the start when there are so many race interruptions. I have had problems at the Traverse in recent years - but it worked out today“, said Swiss athlete, Carlo Janka, who is very pleased with his third place. His compatriot Beat Feuz, who came in second is delighted: „I am back on the racecourse. The most pleasing part is how well things worked out for me today. As an athlete, you don't want to see the kind of falls that happened today, which is why I wish my colleagues a speedy recovery.“ Today's race was proof that it is not all about winning. Be that as it may, Peter Fill is delighted with his winner's "Gams" trophy. 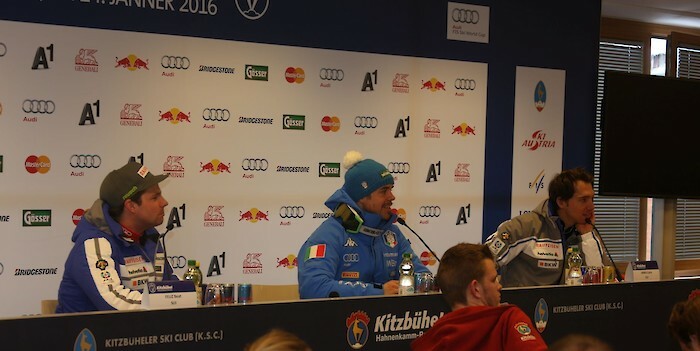 „It was my goal to achieve good results in either Wengen or Kitzbühel. Things did not go to plan in Wengen, but today I won the most important race of the season. When you join the start line here, you know the risks and that you have to give your all. I am fast on every racecourse right now, and I don't know exactly why, although it may have something to so with getting married this summer“, said Fill with a grin. The Downhill winner also celebrates his son's second birthday today.